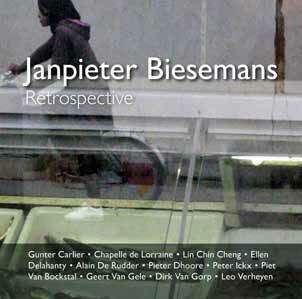 KA006: Janpieter Biesemans, retrospective: This CD takes a special place in the catalog of Kattenberg Recordings, since it is entirely focused on one contemporary classical composer, Janpieter Biesemans. This CD gives an overview of his career as a composer, starting with his opus I, a piano solo composition, until some of his most recent pieces. The CD showcases a whole array of chamber music ensembles, including some pretty uncommon, but very enticing combinations like marimba and recorder; trumpet, oboe and recorder; bass recorder and double bass. The final piece on the disc is a world premier recorder concerto, performed by the Belgian string orchestra "La Chapelle de Lorraine" under the direction of Gunter Carlier. Other great performers on the CD are: Lin Chin Cheng, marimba; Ellen Delahanty, soprano; Alain De Rudder, trumpet; Pieter Dhoore, piano; Peter Ickx, counter-tenor; Piet Van Bockstal, oboe; Geert Van Gele, recorder; Dirk Van Gorp, double bass; Leo Verheyen, trombone. Janpieter Biesemans is a composer with strong roots in early music. With his former ensemble Musicum Antiquum, he was a true pioneer in the early music scene, when he traveled around the globe in the 1960's and '70's. He only started composing in the 1980's, but at the present time, he is in his most productive stage in life. Even though he collects rave reviews from his compositions, as well as from audiences as from written press, he remains very subdued about his own work. He doensn't even like to call himself a composer, but rather a 'notes-notating diarist'. In his compositions, Janpieter Biesemans often takes other cultures as a starting point for his compositions. With this inspation, he is able to synthesize these cultures with his own, creating a very specific language every time again. He has a long standing collaboration with Geert Van Gele and his ensembles, for which he has composed several times. The latest being a unique interaction of Flemish and Spanish music by setting the famous “Coplas por la muerte de su padre from Jorge Manrique (c1440-1479). This was especially composed for the ensemble Quadrivium, which already has recorded his "Nippon waka" on the CD "La Cause est Amer"